Arashiyama is one of the most famous sightseeing spots in Kyoto, Japan. I asked my partner to think about where you want to go in Kyoto, and his first idea was the bamboo woods in Arashiyama. It is the most representing scenery in Kyoto. Arashiyama is famous spot for cherry blossoms and autumn leaves. However, for me, the colour of Arashiyama is green. It is the busy sightseeing spot, but you can see peaceful countryside scenery. The symbol of Arashiyama, Togetsu-kyo bridge. An emperor said " the moon is crossing the bridge". That episode named the bridge. Most of parts of the bridge is made of wood, it suits the area. The river of the north side of Togetsu-kyo bridge is called Hozu gawa river. In Hozu gawa river, a sightseeing bout tour is quite famous. It starts from Kameoka, the town in North Kyoto, and ends in Arashiyama. You can see the beautiful scenery in the river between green mountains and these scenery changes in seasons. Cherry blossoms in spring, rhododendron and greens in summer, coloured leaves in autumn, snow in winter. This photos was actually taken in the cherry blossoms season, but the bright new green was so beautiful. I had never done the tour, I would love to. The walk path in the green world. It's just bamboos, but you are surrounded by green pillars and sunbeams through the bright green roof. In Arashiyama, jinrikisha (rickshaw) is popular. Rickshaws running in bamboo woods look very Japanese. You can see the beautiful rural scenery just after a short walk from the town centre. The thatched house in the left of the photo is built in the 18th century called Rakushi-sha (落柿舎）, the house of Haiku poet. 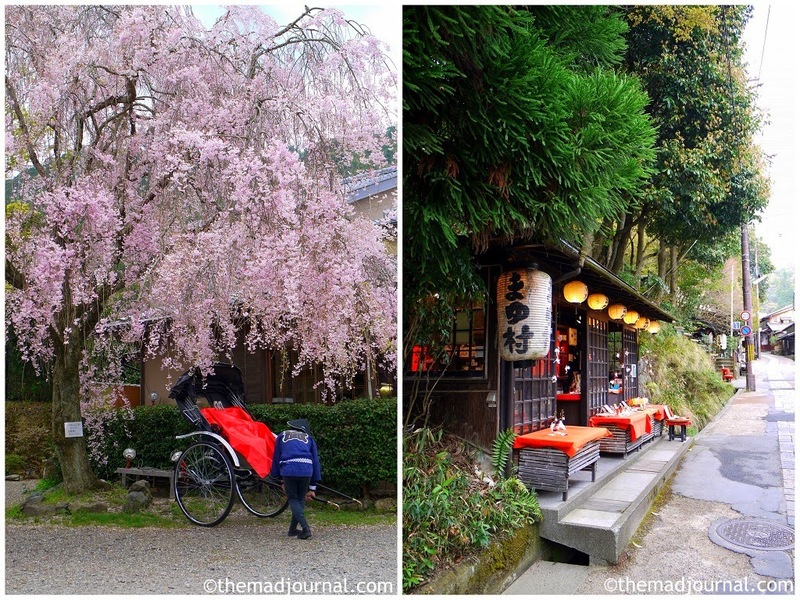 You can enjoy the traditional Japanese scenery in Arashiyama. I recommend to take at least A day there to chill out and enjoy the countryside. When I took my partner to Japan for the first time, we happened to see a festival there. 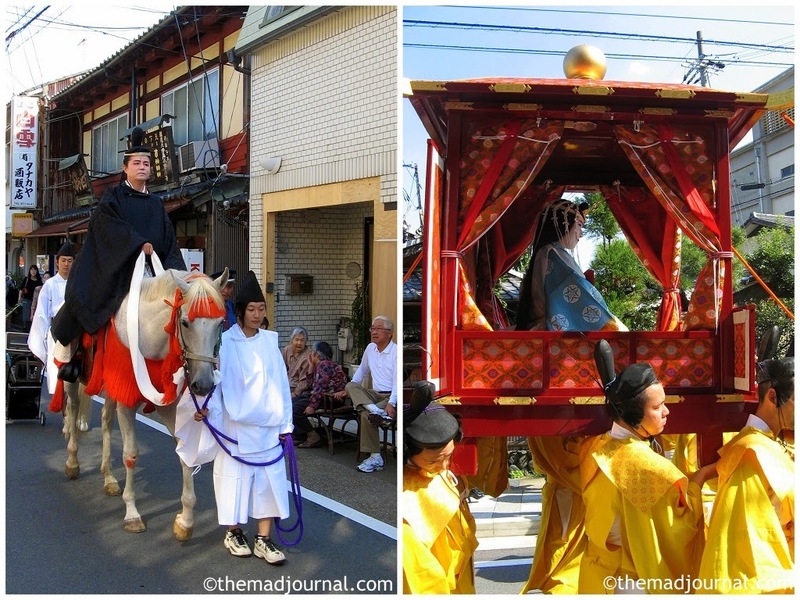 It was Saigu Gyoretsu parade, hold on every third Sunday of October. This parade reproduces the parade which Saigu and companies go to Ise Jingu shrine from Kyoto. People wear the costume of Heian era (1000 years ago). The parade starts from Nonomiya Jinja shrine in the bamboo woods. Nonomiya Jinja shrine used to the place where Saigu was sequestered for 1 year before she goes to Ise Jingu shrine. Arashiyama was a resort district of aristocrats in Heian era. The parade made the atmosphere of the era and we felt like we slipped back in time.